The crop is part of the oesophagus (food pipe) at the base of the neck and is the first stage of digestion for a chicken, it contains food, water and grit (used for digestion). When full, the crop is tennis ball sized. You can sometimes feel the contents of the crop when handling chickens and it can certainly be seen immediately after a chicken has been eating. A pendulous crop is when the crop gets blocked and the food stretches the crop so that it hangs down lower than it should do (and often swings ‘like a pendulum’ as the bird moves around). 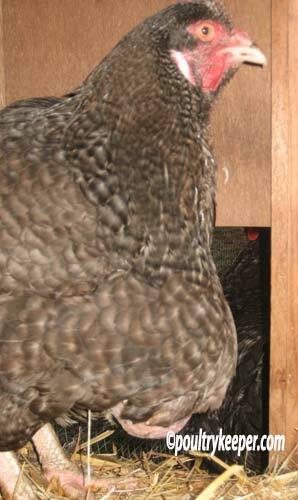 Whilst a chicken may be able to live for some time like this and appear to be in no pain, there is damage being done to the muscles in the crop due to the weight of the food and the more food that goes into it, the more it is being stretched so it is best to address the problem sooner than later. Causes: This problem is very similar to an impacted crop, but in the case of a pendulous crop, the crop has been stretched by the weight of the food inside the crop and the muscles have been stretched and damaged and the crop is unable to push food down to the proventriculus. Treatment – Mild Cases: A pendulous crop can be emptied in the same way as you would for an impacted crop, but vets usually advise putting the bird onto water for 24 to 48 hours in mild cases before gradually re-introducing their food. Treatment – Serious Cases: The contents of the crop can be softened before turning the bird upside down and massaging the crop for a few seconds at a time to empty the crop. There is a risk of the bird choking so you must allow the bird a chance to catch its breath in between. This doesn’t always work (you can’t always completely empty the crop) so if you are in any way unsure, it is better to allow a vet to perform a procedure to cut the crop open and empty it under a local anaesthetic. Chickens crops look big when full (up to tennis ball size). It is normal for the crop to fill like this but it should empty. If in doubt, check the crop has emptied in the morning before a bird has eaten. As already mentioned above, there is a risk of the bird choking when emptying the crop so if you are unsure about this, it is best left to your veterinary surgeon. Emptying a chicken’s crop is straightforward but an advanced technique that can be very stressful for a chicken. Emptying a chicken’s crop is a two person job, you will need to turn the bird upside down to empty the crop through the beak. First, pour either Liquid Paraffin, or warm water with a couple of teaspoons of Olive Oil down the throat and massage the crop for 5 minutes. Whilst holding the bird firmly, turn the bird upside down and massage the contents out through the beak for a short while 5 seconds is usually long enough – before turning the bird back up the right way to breathe. Impacted Crop where there is a blockage in the crop and the crop is full and feels like dough but has not stretched to become pendulous. There will not be the smell that you get with sour crop. Sour Crop which is caused by a yeast in the crop and recognised by a putrid smell coming from the beak. Tip: The tags under the related articles below allow you to view other articles tagged with those symptoms.